Shrimp is of my favorite things to cook on the grill because it's always fast and comes out flavorful. A simple marinade is all you need to start a recipe and my go-to marinade these past few summers has gone the Cajun route. Instead of mixing up my own spices, I just use a good store-bought Cajun seasoning. Besides the shrimp I pack on lots of vegetables that do well on the grill, like peppers, onions and tomatoes. Since it's Father's Day this coming weekend, there's no better time to grill these skewers, which work well as appetizers while everyone waits for the steak or the burgers to get cooking. But I also like to enjoy it as a main dish, especially since I can easily eat quite a few of them. Once you try this easy recipe, you'll see how rewarding it is to grill shrimp. Tip: Grill atop a layer of aluminum foil when using an outdoor grill for easy cleanup and to keep down flames. In a large bowl, combine olive oil, garlic, lemon juice, Cajun seasoning and parsley. Season with salt and pepper. Add shrimp and toss to coat. Marinate for 30 minutes in the refrigerator. Preheat a gas grill or grill pan at medium-high to high heat. Add vegetables to same bowl as shrimp; stir to coat with marinade. 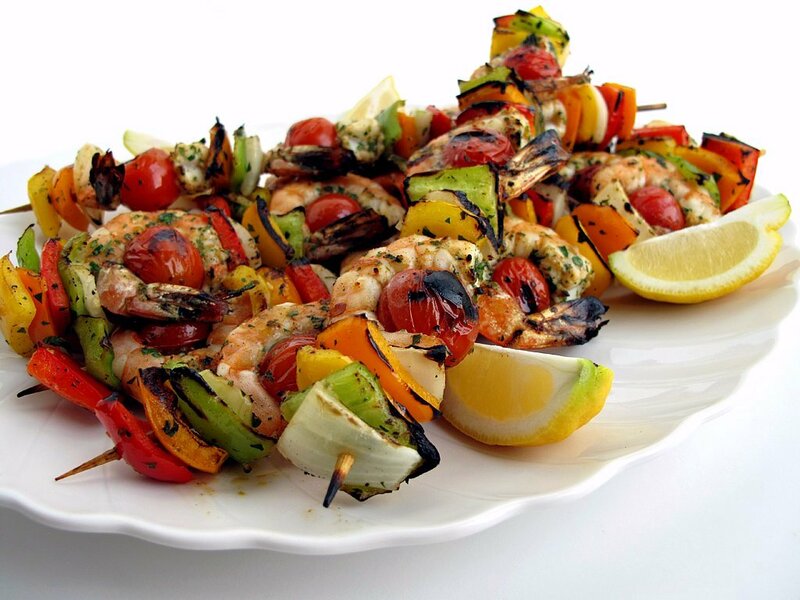 Skewer the vegetables and shrimp, alternating with peppers and onion and then shrimp. Use the cherry tomatoes to secure shrimp. Each skewer should fit about 3 shrimp. Grill for about 3 minutes per side or until the shrimp turn pink. Yield: 4 to 6 servings.